Look for it to get much worse. Politico makes a big deal out of a Trump supporter spitting on and cursing at a Black Lives Matter jerk. First off, there is no context. What did the radical say and do before that happened? Second, I'm not sure you can blame the guy. He's obviously had it with these racist, commie thugs. I know I have. The crowd raged over this. I'm surprised there wasn't a bigger brawl. Guess the state police got there in time and hauled away the disrupters. 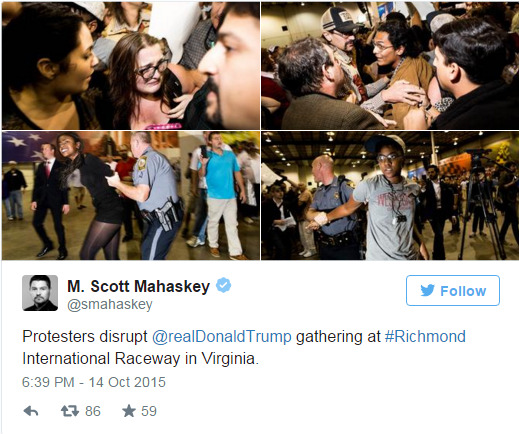 Black Lives Matter thugs and Latino radicals crashed the Trump rally in Richmond, Virginia and this time people fought back. 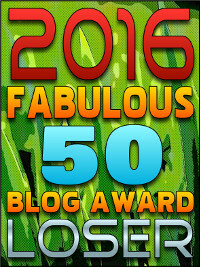 There were 5,000 people there and they were ticked. Trump tried to calm the crowd and eventually things settled back down after about 30 minutes of confrontation. Trump is a brave guy, I'll give him that. 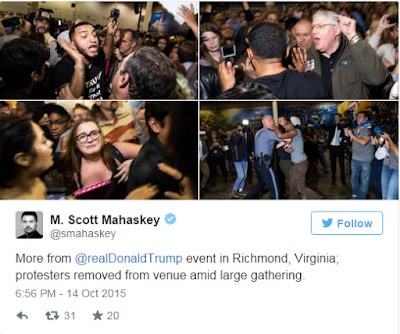 M. Scott Mahaskey, Director of Photography for Politico, posted two batches of photos to Twitter. 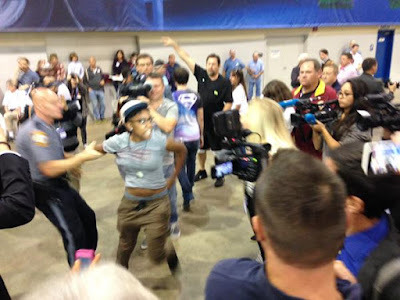 WWBT-TV reporter Mike Valerio posted brief reports and photos of the protesters to Twitter. A video posted to Twitter by CNN’s Jeremy Diamond shows a confrontation between a protester wearing a t-shirt with a profane Spanglish anti-Trump message and an apparent Trump supporter. After yelling back and forth the white male apparent Trump supporter appears to spit on the Latino male protester. 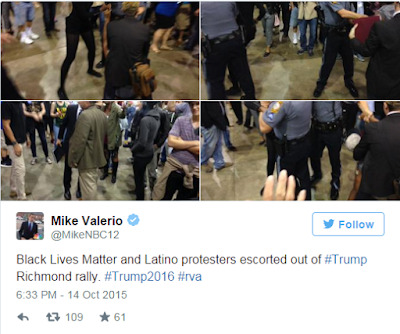 Notice it was the Black Lives Matter and Latino activists who were ejected and arrested. 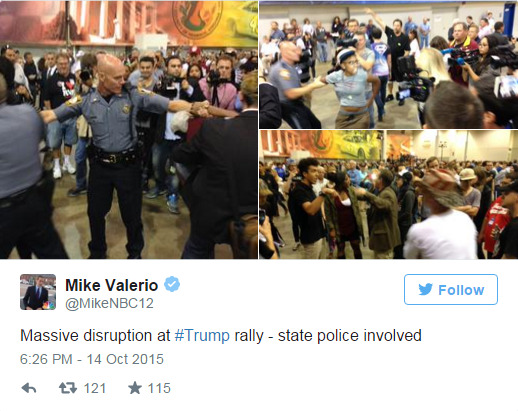 They are going to ramp this up - they want riots and confrontations over Trump. The crowd roared, "We Love Trump!" And the fights ensued. Meanwhile, Trump will just get more and more popular. This doesn't work against him. It will propel him forward. Americans are fed up with these radicals and have had it with them. They want a fighter who will stand up to him. Trump's not backing down. Trump doesn't fold like Bernie Sanders and he doesn't engage them like Clinton. They aren't worth it and they deserve to be dismissed. I'm actually surprised the crowd didn't beat them into a bloody pulp. There's always next week. Giddy up folks... things just escalated. There's a great divide in this country-we will never be united again-now it's all about getting the power and I'm not afraid to say it that it's time for us to not just push back, but to roll these motherfuckers. 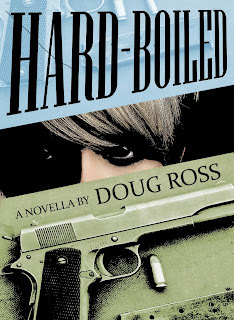 They call it "nudging," but in military circles it's called psy-ops. Useful idiots are so-called for a reason. If such "incidents" are reported, they're passed off as political passions boiling over, not the federally-funded things they are. From trolls in comments sections to words used in every public pronouncement, every bit is filtered and crafted to PISS YOU OFF. Barring that, they send these cretins out to make it physical. And now, we shall have a czar to help identify just where they should "go." Leftism requires an agitated citizenry. The only problem is the citizenry is onto them. Stuck as they are, guns being the impediment. They're not WILLING to be that stupid, they just are. The Democrat party will NEVER recover from the Obama presidency. They have no idea.